The last thing I want to do is preach. Last week, I wrote about whiteness and got a couple of readers telling me that I was being divisive and that they were done with my column. That is OK with me, but it is interesting that it took a column about race to provoke this response. Most people just silently stop reading. I don’t write to please others but I do write for a purpose. I write as personal spiritual practice. I write to explore how astrology can be used for mindful intention. I write to support connection to the sky, to the Earth, and to each other. This week I wasn’t going to repeat myself nor back down from last week. Yes, white people do have a problem. This problem is racism and white people do need to take more action to solve this problem. A lunar cycle introduced by the “Great American Eclipse” seems like a good time to name our collective shadows here in the U.S. and to act from new insights attained after the solar light returns. I thought I had done that and was preparing to talk more about the cusp between Leo and Virgo and the expansive pull of Pisces on our hearts at the Full Moon of September 6, but the shadows keep emerging and I find I can’t be silent about them. This lunar cycle won’t let me. Hatred is a tool of fascism. Singling out and dehumanizing small groups is a technique fascists use to consolidate their power. The more we are encouraged to label someone as other and be disinterested in them or their experiences, the easier it is for fascism to take root. If we let this happen, little by little in small ways, all of us lose our humanity. Transgender people have had a hard road in the U.S. It has never been easy to advocate for one’s gender rights. Whatever few rights transgender folk have won are being systematically taken away and worsened under the Trump administration. I am worried about my beloveds. A friend just shared an article about the purge of transgender people from public life, conceived by the Family Research Council and implemented by Trump’s administration. It is important that we recognize this as a dangerous slide into hatred and a loss of freedom for all of us. The stars offer a lesson as we stand at the crossroads deciding, do we act or do we ignore? 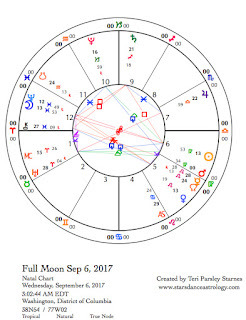 The Full Moon of September 6 occurs in the sign of Pisces. This mutable water sign teaches us about connection and disconnection, the process of humanizing and dehumanizing others. Mutable signs (Pisces, Virgo, Gemini, and Sagittarius) take in information. With antennas up, the mutable signs are reading the vibes and deciding what it means. These signs teach that if we have a healthy balance of self-care and concern for others, we are able to maintain connection pretty consistently. When our information systems overload, we can shut down entirely. Under mutable influence we move in and out of caring too much to not caring at all. If we are stressed, the first thing to go is seeing ourselves in others. If the environment is spewing hate, this lack of caring can turn to blaming and othering. It is just easier to put people in boxes and move on with our lives. This is where we may need to pause and reflect because it isn’t the other who is losing their humanity, it is we who are tuning them out. Pisces is water. Under Pisces we receive emotional information. Our hearts either expand to take in more or we put up barriers. There is no blame for being overwhelmed or reacting the ways we need to. Especially now. At this Full Moon we notice where and how we’ve reached capacity. At this Full Moon there is an opportunity to balance Piscean emotion with Virgoan service. Creating more order, simplifying our lives, or taking care of mundane tasks under the Sun in Virgo influence can help us make more room to feel what we feel and stay open to the humanity in us all. 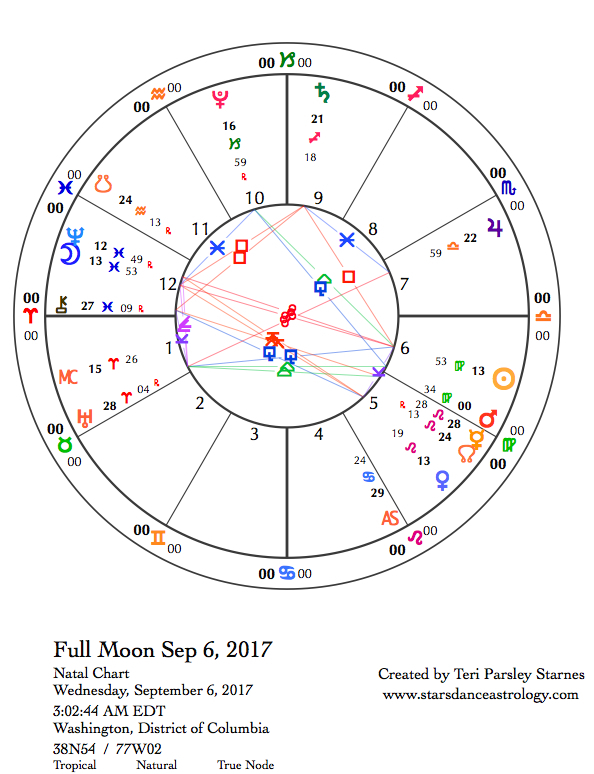 The Full Moon chart shows Neptune conjoining the Moon and opposing the Sun. Neptune, as co-ruler of Pisces, strongly reinforces the Piscean nature of this Full Moon. Our hearts are tender. There is much to feel. What helps you stay present? What happens when you can’t? Reaching capacity is not a sign of failure. Tuning out isn’t either. Perhaps we are learning to notice emotional capacity and the ways we retain not only our own humanity, but the humanity of others, while being at the limits of what we can take in. Toxic shadows are emerging. The stress of change and uncertainty has increased considerably. The Pisces influence of this Full Moon reminds us that connection is key. In whatever capacity we have, to choose each other is a bold act of defiance. Let’s not surrender our humanity. Thursday, September 7. The Moon moving into a fire sign today reminds me to pray for all living beings impacted by the wildfires burning in the western states of the U.S. Fire signs teach us that fire can bring joy and a willingness to step into life, even when we don’t know where it will lead. Fire is creativity and energy. Fire wakes us up. May we awaken. May fire’s hunger be sated. May overheated fires cool. May we know balance again. Friday, September 8. Venus in Leo, Saturn in Sagittarius and the Moon in Aries form a grand fire trine aspect pattern. Venus won’t exactly trine Saturn until September 12 but we feel the fire attraction today too. Trines are supportive, but even assistance from such a temperamental element can be more than we bargained for. Passions are pretty high right now. We may reach the boiling point. We may feel as if we need to act before we lose courage. On one hand, the stars are telling us to trust ourselves more and go for it. On the other, they warn us to build in more space to consider what we are overlooking. Develop a skill for knowing just how much energy is enough and grounding the rest. The Moon makes a square to Pluto in Capricorn and an opposition to Jupiter in Libra. These planets make volatile situations even more so. Be passionate. Be safe. Be willing. September 9—Disseminating Moon: Fruiting. The fruit of this lunar cycle for me is a new commitment to telling the truth. A seed was planted by the meeting of the Sun and Moon in a total eclipse. The real harvest of that experience may take quiet a while. Right now, however, I want to remember the radiant shadow of the Moon crossing the land. I want to invoke the cleansing power of meeting a shadow head on. This lunar cycle is influenced by the cusp between Leo and Virgo. Leo offers creative joy. Virgo offers a willingness to work. The fruit of this offering is sustenance for all the small and large acts of resistance and beauty that are ahead for us. The Moon in Taurus says, take this food. Savor the flavors. Honor the body that does the work and enjoys the sweet moments. Pleasure comes from honesty today as Venus in Leo makes a quincunx aspect to Pluto in Capricorn. This isn’t simple honesty. This is the kind of truthtelling that brings exposure and feels vulnerable. We could be pushed to this place because the secrets are zapping the life force right out of us. The Sun in Virgo makes a supportive trine to Pluto at the same time. This influence brings strength and power. The desire to purge or cleanse is strong. Get down to the essentials. Find the power and clarity that comes from unburdening yourself. Mercury, finally moving direct again, re-enters Virgo. We get another chance to reorganize our thoughts and systems. Sunday, September 10. The grand earth trine of Moon in Taurus, Pluto in Capricorn, and the Sun in Virgo introduces solid ground into a chaotic week. This is a chance to regain your equilibrium and notice where you are, who is with you, and why life matters. In the U.S., school has started, we are harvesting our gardens, we look toward the coming winter. There is a familiar rhythm to this time of year that can help us feel more grounded and present. From that presence, how do we reach out to those who need more connection and support themselves? This may be a good day to form plans for service work to share the struggles as well as the abundance we may feel. Monday, September 11. Squares between the Moon in Gemini and Mars and Mercury in Virgo stimulate our information systems. Stress levels may go up. The battle is between ways we need order and ways we keep introducing more and more chaos into our lives. Perhaps stress levels come down when we take time to process and integrate. What are you learning? Where do you want to focus next? Be willing to try a new approach. Tuesday, September 12. If Saturn is the challenger and Venus is the bringer of harmony, then the trine between these two planets could create a breakthrough moment to a perplexing problem. Perhaps a friend or lover provides the key. Perhaps you appreciate solid relationships even more. Feel free to share encouragement today. It is likely to be accepted and make a difference to the recipient. The Moon in Gemini lightens the mood as well.